Networks (led by Dave Cormier of UPEI, famous for his rhizomatic learning MOOCs and Jesse Stommel, co-director of Digital Pedagogy Lab and Executive Director of the University of Mary-Washington Division of Teaching and Learning Technology). 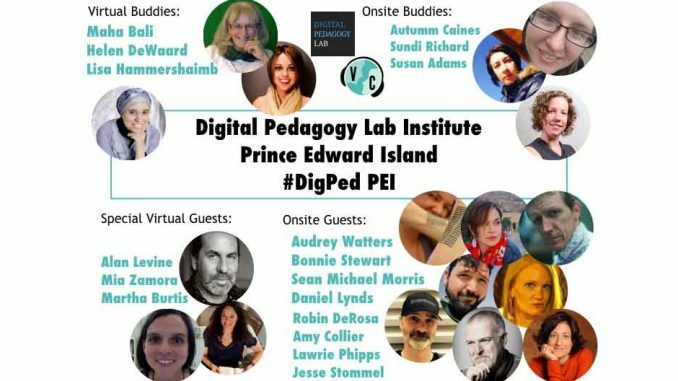 Digital literacies (led by Bonnie Stewart of UPEI, famous for her research on scholarly influence on social media and Sean Michael Morris, co-director of Digital Pedagogy Lab and instructional designer at Middlebury College). If you can’t make it to Canada, you’re in luck because we have a team of onsite buddies (Autumm Caines, Sundi Richard, Susan Adams) and virtual buddies (Maha Bali, Alan Levine, Helen De Waard, Lisa Hammershaimb) who will be connecting you to the conference and almost all of the awesome people we have mentioned above during the institute! All (but one) of the Virtually Connecting are open to up to 8 participants to join. Don’t forget to follow the #digped hashtag and participate to stay engaged. We will tweet and update this post if any keynotes are livestreamed or periscoped. Thursday, July 14th 8am ADT – Alan Levine will connect us with Lawrie Phipps and Cindy Jennings (onsite participant). This hangout has space for virtual participants. The timing makes it particularly convenient for participants in the EuroAfrica timezone to join. You can watch the session live (or recorded) below. Thursday, July 14th 4.15pm ADT – Helen DeWaard will connect us with Audrey Watters and Jesse Stommel. This hangout has space for virtual participants. Keep a look out for a Twitter chat just before this session which Audrey will be participating in. You can watch the session live (or recorded) below. Friday, July 15th 2pm ADT – Apostolos Koutropoulos will connect us with Robin DeRosa and Daniel Lynds during the unconference. This hangout has space for virtual participants. You can watch the session live (or recorded) below. Friday, July 15th 4.15pm ADT – Maha Bali will connect us with Amy Collier. This hangout has space for virtual participants. You can watch the session live (or recorded) below. Oh, wow – I didn’t realize there was virtual connect opportunity! I’ve just been feeling sorry for myself, not able get to PEI. ? I’d love to hear more. I’m interested to listen in virtually on the keynote and “Digital Capabilities and Leadership” sessions. I am interested in the sessions.I don’t have a handle on what some of them are about but I am a teacher and want to develop in the tech area. I am surely interested, and have responded to a tweet by Maha.Bali, to a VC.